Sandra will study computational methods and novel in vitro tools according to their suitability to support the development of solid dispersions. The research will be in close collaboration with other PhD students working on solid dispersions (e.g. ESR 2) as part of the work package 1. Sandra Jankovic holds a Master of Science degree in Chemistry and Pharmaceutical Technology from the University of Milan, Italy. 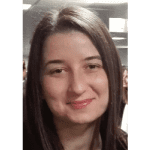 During her master studies, Sandra followed a course divided into two modules: metal-assisted advanced synthesis and nanotechnology for biological application. She chose the latter as the field for her master’s thesis, which was entitled "Study of the antibacterial Effect of Silver nanoparticles with Gentamicin". Sandra is a licensed pharmacist.